A 2019 study by scientists at the Lawrence Livermore National Laboratory in California has come to a startling discovery that man-made global warming has reached a "gold standard" level of certainty, with rising temperatures. One of the causes has been attributed to the burning of fossil fuels, which is causing more floods, droughts, heat waves, and rising sea levels. How do we then do our part to prevent climate change? One of the ways is to conserve and use energy efficiently. With less demand for electricity, this in turn reduces power plant emissions, contributed by the burning of fossil fuels such as coal, crude oil, and natural gas. Another option is to generate electricity from alternative clean energy sources. This will subsequently reduce our dependency on the traditional power supply grid. In line with one of the United Nation’s Sustainable Development Goal, we recently installed solar panels around the campus. Solar panels convert energy from sunlight into electricity. 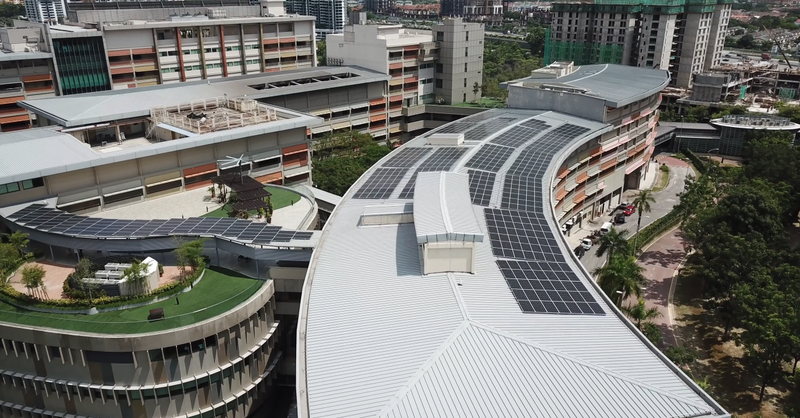 As of January 2019, the campus Facilities Management has noted that 80% of the Library and Learning Commons Building lighting is now powered using renewable energy, harvested from the solar power system. The objective of this initiative is also aligned with the government’s approach on going green as encouraged by Minister Yeo Bin Yin, the Malaysian Minister of Energy, Technology, Science, Environment and Climate Change. The ministry has set a target of 20% of the country's electricity to be generated from renewable sources by 2030, an increase from 2% currently.